Everyone loves chocolate, the delicious sweet that can be used in many different fashions. It's used in desserts, dinners, drinks, and more. But, how many people know about where their chocolate comes from? In this documentary learn about how manufacturers could be putting third world children in danger. Imagine your child out in fields; dirty, hungry, and abused. Imagine your child being taken from you and forced to work for hours a day for little to not compensation. This terrible scenario is a reality for many children in third world countries. 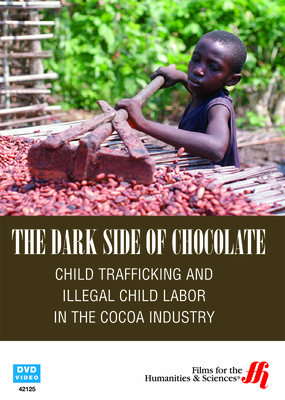 Child trafficking has become a huge problem; especially in the chocolate industry. In less than an hour this reveling documentary goes inside the world of where chocolate comes from. This documentary follows the lives of children who are forced to work in the industry; from the confectionery trade shows in Germany, to the destitute cocoa farms in Mali. Viewers will find themselves wondering if the chocolate industry is simply ignoring the suffering of children in order to achieve cheap labor and maximum profits. Portions of this DVD include English subtitles.